Golfer’s elbow can affect people of any age who engage in repetitive elbow movements. It is seen more commonly in certain occupations, such as golf players or carpenters, who repetitively swing or perform hammering type movements with their elbow. Golfer’s elbow is not as common as Tennis elbow. The repetitive swinging movements place excessive stress on muscles that bend the wrist and twist the forearm. These muscles, known as flexor carpi radialis and pronator teres, insert onto a bony prominence on the inner aspect of the elbow known as the medial epicondyle. Small tears and scars occur in the muscles due to their overuse, which causes pain, felt at the medial epicondyle particularly when stress is placed through the muscles. Usually the dominant arm is affected, since this arm performs the repetitive movements that lead to overuse and muscle damage. 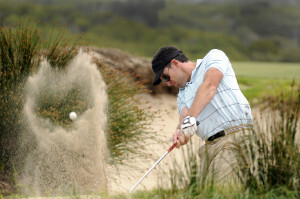 In golf players it is the leading arm that is affected e.g. the left arm for the right-handed swing. Pain on swinging the elbow with bending and twisting at the wrist is characteristic of golfer’s elbow. The pain is felt as a dull ache over the bony prominence at the inner aspect of the elbow (medial epicondyle). It may occur at rest but is typically worse when using the damaged muscle e.g. when golf players perform a swing. The inner aspect of the elbow is also tender to touch. In some patients the pain may spread down the forearm. Loss in muscle strength with resultant difficulty in holding objects and loss in a full range of elbow movement may also occur. A medical history and clinical examination of your elbow is the first step and usually enough to reach a diagnosis. X-rays may be performed to identify any elbow arthritis. More advanced imaging such as MRI or US may be needed when the diagnosis is in doubt or to plan surgery. You may require nerve conduction studies if damage to any forearm nerves is suspected. Movements which cause pain, should be lessened to allow the muscle and tendon to recover. You may need some time off work to allow this recovery to happen. However, these movements should not be completely stopped as this may lead to elbow stiffness. Surgery aims to reduce the pain and inflammation experienced in golfer’s elbow by removing the damaged area of the affected muscle and tendon. This is most commonly the flexor carpi radialis and pronator teres muscles and their tendons. The remaining part of the muscles is then re-attached to bone. A scar measuring 2 to 3cm is needed around the elbow to directly view and cut away the damaged region of muscle and tendon. You will be followed up in Mr. Naqui’s clinic within 2 weeks of surgery. This is dependent on symptom severity, your normal daily activities, the surgery performed and your rate of recovery. Following a discussion with you a specific recommendation will be made based on these factors. Manual workers whose occupation was the main cause behind developing golfer’s elbow may need to discuss a modification of their work activities with their employer or take some time off work to enable a safe recovery. Full recovery may take from 6 months up to 2 years. Since patients often continue with the occupation that initially caused their golfer’s elbow, it is possible that the condition will recur.